Lying in a tranquil residential area, Centre Point Sukhumvit 10 is a haven of comfort surrounded by a magnificent lake view with easy access to business areas, shopping centers and international schools. Spaciousness and serenity make Centre Point Sukhumvit 10 an ideal home of executives' family members. This year, Centre Point Sukhumvit Soi 10 has come up with another exciting innovation that gives a different twist to the modern urban lifestyle: The Garden Wing. The Garden wing - a five-storey structure - adopts a resort concept of accommodation, smack in the heart of this bustling metropolis. Built adjacent to the Main Tower, it features a beautiful garden where residents can relax in the verdant shade of mature trees. Ideally for family residence, we offer spacious fully- furnished one, two, three and four-bedrooms which are delicately decorated to best serve your private relaxation needs. One-Bedroom ( Type A ) 73 sq.m. Luxurious apartment with 1 living room, stereo and DVD player, 1 master bedroom (1 king-size bed), 1 bathroom (integrated shower and bathtub), 1 washing machine, and 1 kitchen. 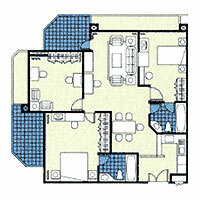 One-Bedroom ( Type B ) 89 sq.m. Spacious apartment with 1 large living room (convertible to be one another bedroom), stereo and DVD player, 1 master bedroom (1 king-size bed), 1 pull-out sofa bed, 2 bathrooms (integrated shower and bathtub), 1 washing machine, 1 kitchen. 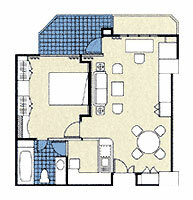 Two-Bedroom ( Type D ) 94 sq.m. Spacious apartment with 1 living room, stereo and DVD player, 1 master bedroom (1 king-size bed), 1 private bedroom (1 single bed), 2 bathrooms (integrated shower and bathtub), 1 washing machine, and 1 kitchen. 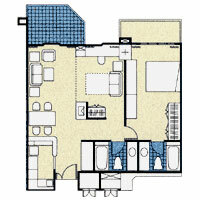 Two-Bedroom + 1 Study Room ( Type I ) 121 sq.m. 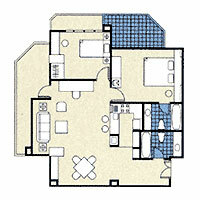 Three-Bedroom ( Type E ) 121 sq.m. The Garden Wing at Centre Point Sukhumvit Soi 10 offers a refreshing new blend of these and other aspects of design, in what is a first-of-its-kind innovation in serviced apartments. Whether studios or deluxe units, all are tastefully decorated to make the most of this different ambiance. Trendily designed and furnished, they match the lifestyles of people with a modern attitude. As such, it is a style that appeals most to those living life in the fast lane. With its classic appeal, the Colonial style captures the romanticism of days gone by. Classical lines and colours are perfectly blended to create an intriguing ambience. And all complemented by the things that make one feel most at home. Experience the charms of the East. Enjoy the grandeur and majesty of an oriental setting coupled with all the amenities that guarantee a most comfortable and convenient stay. The tropical style breathes added life and freshness into the allure of the tropics while embracing all the comforts of a modern home. 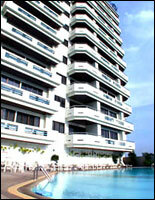 Modern facilities are provided to serve executives and families. While you are refreshed in the fitness center or swimming pool your children can enjoy playing in the Kids Room. If you like outdoor exercise, you can do walking or jogging at the Queen Sirikit Lake, just only 5 minutes away.